We’d love your help. Let us know what’s wrong with this preview of Escargot by Dashka Slater. To ask other readers questions about Escargot, please sign up. Bonjour! I see you are staring at me! My name is Escargot, and I am such a beautiful French snail that everybody stares at me. Right now, I am traveling to the salad at the end of this book. It is a beautiful salad, with croutons and a light vinaigrette. You should come! I just need a little push to help me start. While we are traveling, we can talk. Tell me, what do you think is my most beautiful part? Oh là là! It is so hard to choose! That is because all o Bonjour! I see you are staring at me! That is because all of Escargot is magnifique! You can kiss me if you want. Let's talk about our favorite animals. Is yours the dog? The cat? The platypus? The wildebeest? The lemur? The hippopotamus? Wait! Before you answer, I must tell you something sad. So sad I might cry. Will you stroke my shell, just until I feel better? Nobody ever says their favorite animal is the snail. Perhaps you think, "Snails are slimy, Escargot! You are too slimy to be my favorite animal!" TL;DR You have to read it right now. It is TOO CUTE. AMAZING WORK by Slater. Highly recommended. Je t'aime, J'adore. Dear reader, this book breaks the fourth wall using a snail as a French cliche to tell the joke. The snail is so cute and leaves shimmery trails behind him. He is racing you in the book. He talks to you the whole time. He wants to convince you he is worthy of your favorite animal and to love salad. I ended up loving this book. It is fantastique! I read it to the nephew and we had so much fun that my niece came in and we read it all over again. The nephew wanted to as much as m Je t'aime, J'adore. Dear reader, this book breaks the fourth wall using a snail as a French cliche to tell the joke. The snail is so cute and leaves shimmery trails behind him. He is racing you in the book. He talks to you the whole time. He wants to convince you he is worthy of your favorite animal and to love salad. I ended up loving this book. It is fantastique! I read it to the nephew and we had so much fun that my niece came in and we read it all over again. The nephew wanted to as much as my niece. This was a favorite here. They asked to read it again tomorrow. What is your favorite animal ? Mine is the french snail. Oh he so cute, so full of adorableness, and personality. He will win your heart and perhaps get you to eat your veggies with a bit more love. The artwork is beautiful, soft and colorful. There might be a lesson along the way about trying foods you've never tried before but know you hate, but I'll not spill that detail. I will buy this as a gift for small children. This little French snail desperately wants to be someone's favorite animal and to get to the wonderful salad at the other side of the table. He may need a bit of help in this read-aloud gem, that's even more fun when you use a french accent! C'est magnifique! !-Jen K.
My favorite animal is now the snail. PLEASE WRITE A SEQUEL(S) to this book! I have a very "strong-willed" three-year-old daughter who is of the overly picky eater variety. It's bad. I cannot emphasize how exhausting this is. This book has helped our family so much, and we are so grateful. It's also just a lovely picture book. This is hands-down Charlotte's favorite book and our favorite book to read as a family. It must be read in an excruciatingly bad fake French accent. I read it this way. My husband reads it this PLEASE WRITE A SEQUEL(S) to this book! This is hands-down Charlotte's favorite book and our favorite book to read as a family. It must be read in an excruciatingly bad fake French accent. I read it this way. My husband reads it this way. My mother-in-law even joins in - even our daughter can now give a "voice" to Escargot. I read an early copy of this book via work, with no obligation to leave a personal review. 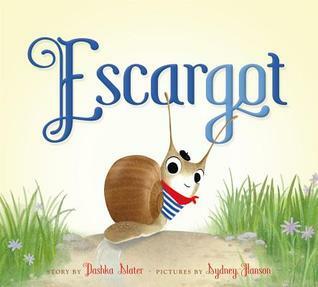 I love Escargot, this book's title character, and you will too. Some French charm, beautiful illustrations, and cute all around--with a little message in there about not being too picky with your food, too. Escargot warmed his way into my heart. This is another book that makes me wish I had an audience for a preschool story time this year. Super cute! I loved how the book got you to interact with the story. My son had a lot of fun! I'm just sorry my poor baby had to listen to my god awful attempt at a French accent. At least it made him laugh! My children have now had me read this book thrice and if I don't hide it, I bet I'll be reading it again. To get 5 stars from me, the voice needs to be immediate and distinct that it makes you read it in character. And this one does, thankfully I knew the little French that is in there, but that could be a stumbling block if you want to read before hand to know if you have the pronunciation right if you know no French. This book is the character talking directly to the children and so enticingly My children have now had me read this book thrice and if I don't hide it, I bet I'll be reading it again. To get 5 stars from me, the voice needs to be immediate and distinct that it makes you read it in character. And this one does, thankfully I knew the little French that is in there, but that could be a stumbling block if you want to read before hand to know if you have the pronunciation right if you know no French. This book is the character talking directly to the children and so enticingly so that the children keep talking back, at least the 4 year old does, but the 6 and 11 year old were totally game to talk back to the snail too, and so I had to start ad-libbing responses because the 4 year old especially, though the others did occasionally, kept asking the snail really good questions that I just couldn't ignore. I'm usually a "non-fun out loud reader" that I often say "shhh, just listen to the story" but this one is so fun I was totally willing to make up story in the snail's voice on-the-spot for entertaining purposes. I'd like to hang out with Escargot any day. Snails are my favorite little Gastropods! Escargot's journey to the salad at the end of the book was so much fun! This would be awesome read aloud. 4.5 stars - Adorable & funny. Must be read in a French accent. I double dog dare you to read this aloud without attempting a (bad, my case) French accent. Will be a blast at storytime. This book BRILLIANTLY breaks the fourth wall and calls for reader participation. Escargot's dry humor will please listeners of all ages, while the interactive elements will capture the attention of young readers. I cannot wait to read this at storytimes! Escargot est mon animal préféré! C'est magnifique! C'est incroyable! J'aime Escargot!! This book is very sweet and has to be read with a thick French accent, a la the chef in "The Little Mermaid." He he he! Hon hon hon! If you don't find this book amusing, you have to be a little bit dead inside. Okay, this was just so stinking cute, I've got heart eyes. Très magnifique. What an adorable, CHEEKY, little book about a snail named Escargot. Illustrations are very cute. Escargot is a small snail who has one big plan. He has to get to the salad at the end of the book. Along the way, Escargot tries to convince the young reader that snails should be their favorite animal. They will have to ignore the trails of slime on the page and focus on how very brave snails are and maybe how fast? The reader helps Escargot along the way, testing out ferocious faces, given him a little push, and offering kisses too. By the time Escargot reaches the salad, he will have won thei Escargot is a small snail who has one big plan. He has to get to the salad at the end of the book. Along the way, Escargot tries to convince the young reader that snails should be their favorite animal. They will have to ignore the trails of slime on the page and focus on how very brave snails are and maybe how fast? The reader helps Escargot along the way, testing out ferocious faces, given him a little push, and offering kisses too. By the time Escargot reaches the salad, he will have won their hearts, just in time to try a new vegetable together. Slater cleverly combines several themes in this picture book and melds them in such a way that they work seamlessly with one another. There is the interactive piece of the book that ask the child to participate and impact the story. There is the favorite animal part that is engaging and funny, filled with enough action and interaction to keep even restless children busy. The final aspect is the bravery piece, trying something new and being a friend. Hanson’s illustrations add to the appeal of the book. 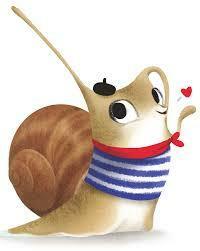 Escargot wears a jaunty striped shirt, red scarf tied at his neck and a beret. He oozes French appeal and confidence even as he is willing to ask for help. He is expressive with his wide eyes and tilting antennae that he uses to gesture. 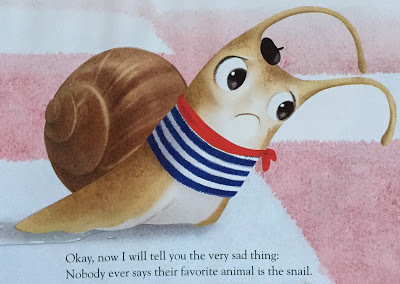 I still don't know how I feel about snails, but Escargot is my favorite children's book at the moment. It is the modern version of Pepe Le Pew's silly stereotypical French pomposity. Perhaps only Ronaldo can surpass Escargot's self esteem, but the humorous repartee may be unmatched for cleverness. Don't believe me? Try reading it with a handy snack, perhaps a CARROT! In this clever little character, the "eyes" have it. very young will be charmed by the snail's cheeky attitude and voice, especially if the reader adopts the French accept implied by various phrasings. Established readers and writers will benefit from using this as mentor text for second-person voice, character development, humor writing, and even as model text for taking a seemingly unlikeable animal/character and writing persuasive text to win fans. I must admit to feeling a bit misled that th In this clever little character, the "eyes" have it. very young will be charmed by the snail's cheeky attitude and voice, especially if the reader adopts the French accept implied by various phrasings. I must admit to feeling a bit misled that there could be danger facing escargot when he reaches his destination- unexpectedly becoming the meal instead of enjoying a meal. I was pleased when that wasn't the case, but felt it should probably have been pointed out somehow, somewhere. Anyway, those eyes... those appealing eyes! Technically, I haven't "read" this book, only listened to my husband read it -- in the requisite French accent, bien sur! It's as refreshing as a salad with croutons and a light vinaigrette. We've had it from the library for two days, and have already decided to buy it for ourselves and family. My 16-month-old gets super excited whenever Dad picks it up. Whenever we flip to the page where Escargot is relaxing on the blanket with sunglasses and a sun tanning reflector Technically, I haven't "read" this book, only listened to my husband read it -- in the requisite French accent, bien sur! It's as refreshing as a salad with croutons and a light vinaigrette. We've had it from the library for two days, and have already decided to buy it for ourselves and family. My 16-month-old gets super excited whenever Dad picks it up. Whenever we flip to the page where Escargot is relaxing on the blanket with sunglasses and a sun tanning reflector, my son points to Escargot and, with excited glee, shrieks, "Mama!" Perfect for your snail finding friends! This adorable snailed named Escargot is in the mood for a salad, but on the way, he will have a lovely conversation with you about your favorite animal. By the end of the book, your favorite will obviously be the snail with the French accent. The artwork is wonderful and the book asks the reader to be interactive. A fantastic read for young kids and adults that like to fake a French accent while they read. This would make a wonderful read-aloud for story time! I would read it with a French accent and maybe supply the carrots to the children so they can try them with Escargot. Snails are not my favorite animals but after reading this, they move up the list. This little French snail desperately wants to be someone's favorite animal and to get to the wonderful salad at the other side of the table. He may need a bit of help in this read-aloud gem, that's even more fun when you use a french accent! C'est magnifique!! Dashka Slater’s novel, The Wishing Box, was named one of the best books of the year by the Los Angeles Times, which called it “an impish novel, hopeful and full of humor.” She is the author of four acclaimed children's books: Baby Shoes; Firefighters in the Dark; The Sea Serpent and Me and Dangerously Ever After. She has two picture books forthcoming in 2017, as well as the much-anticipated Young Dashka Slater’s novel, The Wishing Box, was named one of the best books of the year by the Los Angeles Times, which called it “an impish novel, hopeful and full of humor.” She is the author of four acclaimed children's books: Baby Shoes; Firefighters in the Dark; The Sea Serpent and Me and Dangerously Ever After. She has two picture books forthcoming in 2017, as well as the much-anticipated Young Adult non-fiction narrative The 57 Bus. Slater is also an award-winning journalist who has written for such publications as Newsweek, More, Salon, Mother Jones, Sierra, and The New York Times Magazine. The recipient of a Creative Writing Fellowship from the National Endowment for the Arts, she is currently working on new books for both children and adults. Learn more at www.dashkaslater.com.